The 541NBXT Smoke Detector self-diagnostic, two-wire smoke detectors are the industry's first conventional direct-wire smoke detectors with analog features such as remote maintenance/trouble reporting (CleanMe), drift compensation, and multi-criteria detection. The 541NBXT Smoke Detector continually monitor their own sensitivity and operational status, and provide a visual and remote trouble condition if they drift out of the sensitivity range or fail internal diagnostics. This meets NFPA 72 field sensitivity testing requirements without the need for external meters. 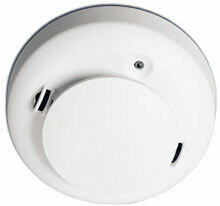 The 541NBXT Smoke Detector has a unique feature enabling it to send a signal (CleanMe) to the ESL 505 module (sold separately) when it has drifted outside of its UL Listed sensitivity range or has failed its internal diagnostics test.